Thanks to a hardware exploit and a few software ones, Nintendo’s Switch has been cracked open. When that happens to a platform, it invariably gets flooded with cheaters. Splatoon 2 is now rife with them, and Nintendo has no real answer to this. There are some ways to report cheaters and griefers – players who’re invisible, have infinite ink-meters and invulnerability – but they’re not effective. Nintendo is leaving players to do the policing themselves, and it’s just not working. It’s leaving legitimate players frustrated. One became frustrated enough to hack the leaderboards, begging Nintendo to add some sort of anti-cheat system. 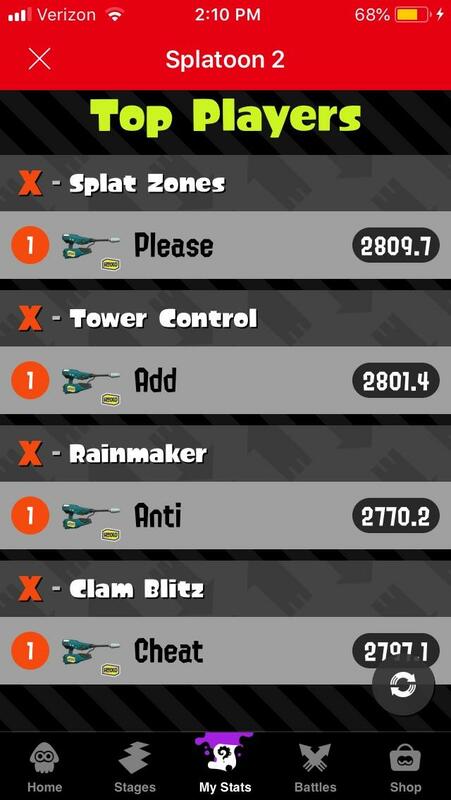 “I’ve never personally played the first Splatoon, but I heard how bad it was, being overrun by cheaters who tamper with the game and impose unfair advantages on others,” PleaseAddAntiCheat said. Unfortunately, it’s not quite worked out. Instead, Nintendo has banned the virtual protestor. The hacker, PleaseAddAntiCheat, has confirmed that Nintendo has banned his Switch from online activities indefinitely, along with a message from Nintendo. “Thank you for using Nintendo Switch,” says the message. Nintendo apparently won’t reverse the ban either. “This is Nintendo’s final decision. If violations continue, other actions, such as further restricting your usage of Nintendo Account services may be taken. That’s…taking one for the team, I guess? On the plus side, Nintendo’s definitely seen the message. Hopefully this leads to some sort of anti-cheat system, or this digital martyrdom’s all for naught. Previous article It’s time to work on your cardio again, as Zombieland 2 is officially happening in 2019!